Air core coils are the best possible solution. To ensure a capacitive coupling only to neighbouring and not all turns, Mundorf manufactures an oxygen free copper foil coil (OFC copper). The coil shows a consistent performance even beyond 100 kHz. The large surface reduces the skin effect (higher frequencies are carried on the copper surface). Additionally, the coil has a tough, yet elastic isolation made from polypropylene foil ensuring a high mechanical stability and, therefore, suppressing vibrations efficiently. A lab test carried out by Hobby HiFi (4/2000, starting at page 66) confirms both points: this coil is far better than vacuum impregnated round wire coils or baked varnish coils (and obviously standard coils) and is clearly superior to TRITEC coils and foil coils by CFAG (vibration, microphonics). Mundorf is certain that these characteristics cause a considerable improvement in dynamics, attention to detail and three-dimensionality. This type of CFC coils you'll find e.g. in the Magnat Vintage 990 setting you back some 40.000 EUR (ref. Stereoplay 12/2001 page 12). In the picture you'll notice the tightly wound coil and above the wide foil connectors that can be shortened to the required length. The picture shows the dense winding with flat contacts made of foil that may be shortened to the required length. Pure silver foils are highly appreciated due to their ability to reproduce the timbre vocals and instruments extremely detailed, neutral and with subtle nuances. According to Mundorf, the addition of 1 % purest gold to the silver foil improves on the crystalline structure of the silver, accomplishing a slightly warmer sound characteristic. 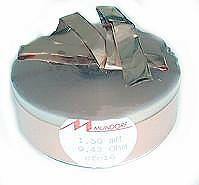 The Supreme Silver / Gold capacitors are brand new additions to the Mundorf range of products. 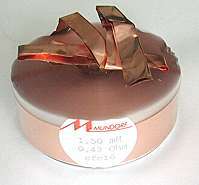 The high-quality winding technique - known from the Supreme capacitors - is blended with silver foils, containing 1% gold. According to Mundorf this considerably improves on the crystalline structure of the silver. This inductor combines precision with harmony and elegance.